I don’t intend to provide a book review here; you can easily find them elsewhere. Instead, I will share just a brief excerpt of what I found particularly interesting and well-written. As you can see, this book passed the “tape flag test” for me, meaning there are plenty parts I intend to reread or share. Siefe is not without his critics, as can be readily ascertained from the reviews. One particular criticism is directed at his penchant for neologisms, including the titular one. 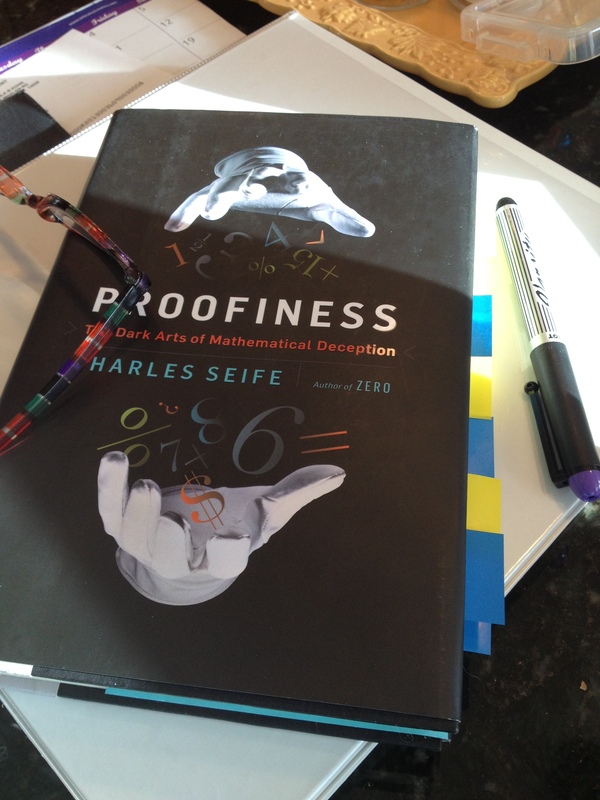 Proofiness, the author contends, is the art of using bogus mathematical arguments to prove something that you know in your heart is true-even when it’s not. I like playful neologisms (as should be evident from the title of this blog), and Proofiness is rife with them – disestimation, randumbness, and causuistry, to name a few. Here’s one passage I like from Chapter 1: It’s universal; behind every real-world number, there’s a measurement. And because measurements are inherently error-prone (they’re performed by humans, after all, using instruments made by humans), they aren’t perfectly reliable. Even the simple act of counting objects is prone to error…As a result, every measurement and every real-world number is a little bit fuzzy, a little bit uncertain. It is an imperfect reflection of reality. A number is always impure: it is an admixture of truth, error, and uncertainty. Proofiness has power over us because we’re blind to this impurity. Numbers, figures, and graphs all have an aura of perfection. They seem like absolute truth. The numbers of our everyday world – the numbers we care about – are flawed, and not just because measurements are imperfect. They can be changed and tinkered with, manipulated and spun and turned upside down. And because those lies are clad in the divine white garb of irrefutable fact, they are incredibly powerful. I think my first inclination to regard statistics with some degree of skepticism was when I learned (in 6th grade perhaps?) to convert fractions to percents and realized that the “4 out of 5 dentists recommend sugarless gum…” commercial that aired thousands of times during my childhood actually comprised only 80% of dentists, and as such, was much less convincing than the Trident Gum company intended for its viewers. A sad day for me, indeed, and one that Seife so eloquently captures in a discussion of information theory. From Chapter 8: Knowledge-gathering is systematic demolition and reconstruction of our view of the world…It can be an unsettling and uncomfortable process. It’s never easy to destroy a cherished myth, to abandon a deeply held belief, or inject shades of gray into a debate that one seemed black and white. It’s human nature to resist change, to cling to our old, familiar ideas instead of abandoning them in the face of new information. To this day, I prefer Dentyne gum. Coincidence? I think not. What are your favorite fun books about numbers, data, or statistics? Jim, I agree wholeheartedly! It’s also challenging for people to recognize that culture and context bring so much to bear on the statistics that are reported, and this is hardly limited to educational settings. Thanks for your comment! I love that quote, and always think of Mark Twain, who supposedly popularized it. There’s also a series of books titled with a version of that quote (they’re on my list to read). Wish I had seen that AEA presentation!